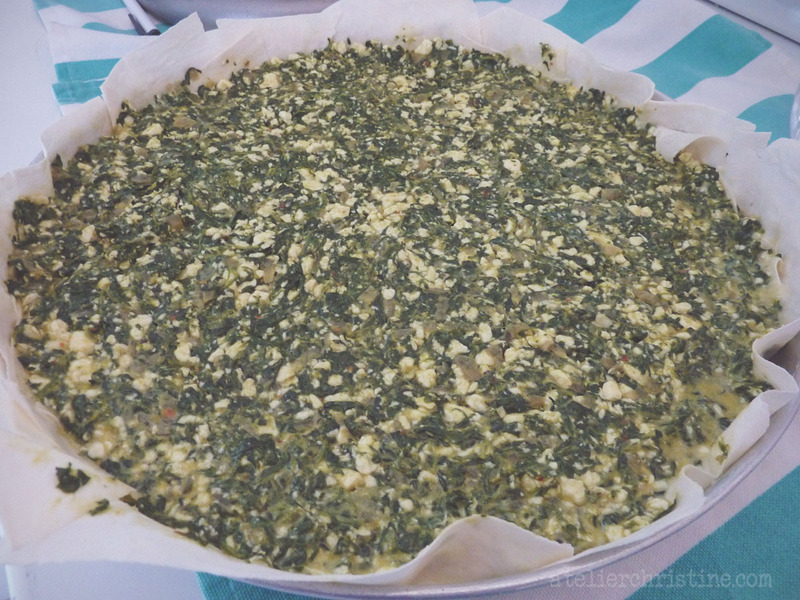 The filling is a mixture of fresh spinach leaves, onion, spices and crumbly white feta cheese. California Feta is moist and not as sour and salty as most other Feta cheeses. 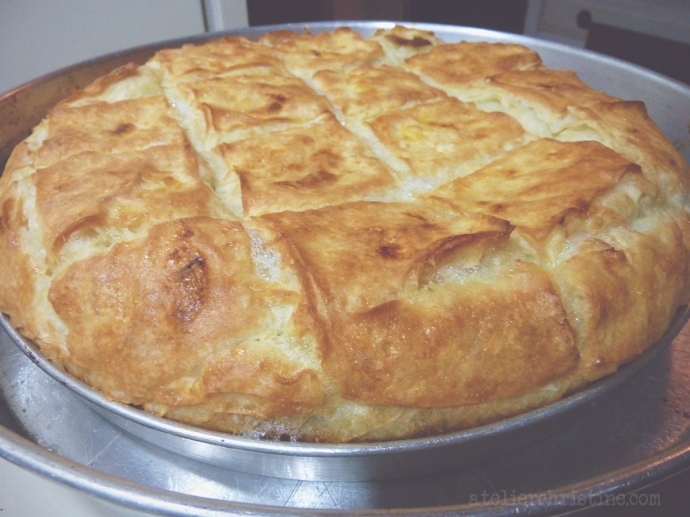 Phyllo or filo dough, also known as kallaj / gollash pastry and yufka, are thin sheets of dough used for sweet and savory pastries like baklava and borek. It is found frozen in almost all supermarkets and numbered according to thickness. The thinnest of all is used for baklava, No.7 is used for most triangular and spiral savory pies and No.10, country-style phyllo dough, is used for rustic pies such as this one. The pastry sheets are brushed one by one with a milk, egg, oil, butter and sparkling mineral water mixture. You can substitute sparkling mineral water with seltzer or soda / carbonated water. Start from the middle and work towards the edges, and don’t forget to cover remaining dough so it won’t dry out. Always defrost unopened phyllo dough box in the refrigerator for at least 24 hours to avoid cracking and prevent the sheets from sticking together. And once you start working with it make sure to cover the remainder with a damp towel, because it tends to dry real fast. Now, be gentle handling the sheets, they tear easily. If your pan is less than 2”-deep I suggest placing it on a baking sheet to prevent oil drippings. Once you remove the pastry from the oven it will be puffy and steaming hot but will gradually deflate; so allow it to sit for about fifteen minutes, re-cut where the lines are and serve. 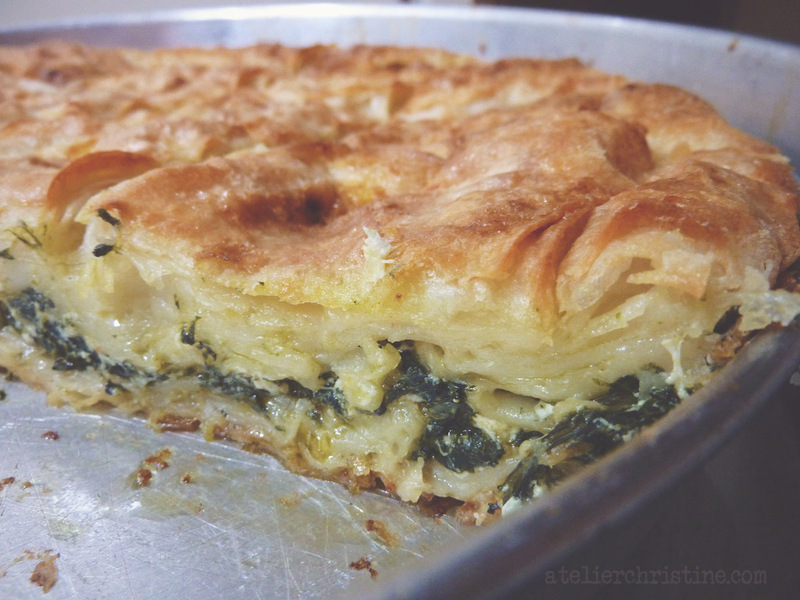 This spinach and cheese pie is equally good served slightly warm or at room temperature. Prepare filling. Bring water to a gentle boil, add salt and blanch spinach until almost wilted. Drain and thoroughly dry on paper towels. Sauté onions in three tablespoons oil until translucent but not browned. 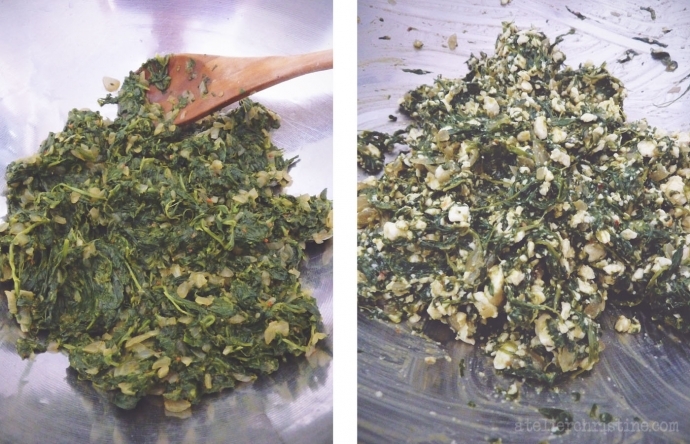 Add spinach and remaining one tablespoon oil and stir-cook for 5-to-7 minutes. Turn off heat, add salt and spices then set aside. Once cool, gently mix in cheese. * you can make this without spinach; simply use about 3-to-4 cups of cheese. You can combine a variety of white cheeses with any curd cheese, or use Feta cheese with a little bit of yellow semi-firm melting cheese added to it, like Pecorino-Romano or Kashkaval cheese. Simply add a large bunch of parsley and omit spices and salt. Prepare liquid mix. 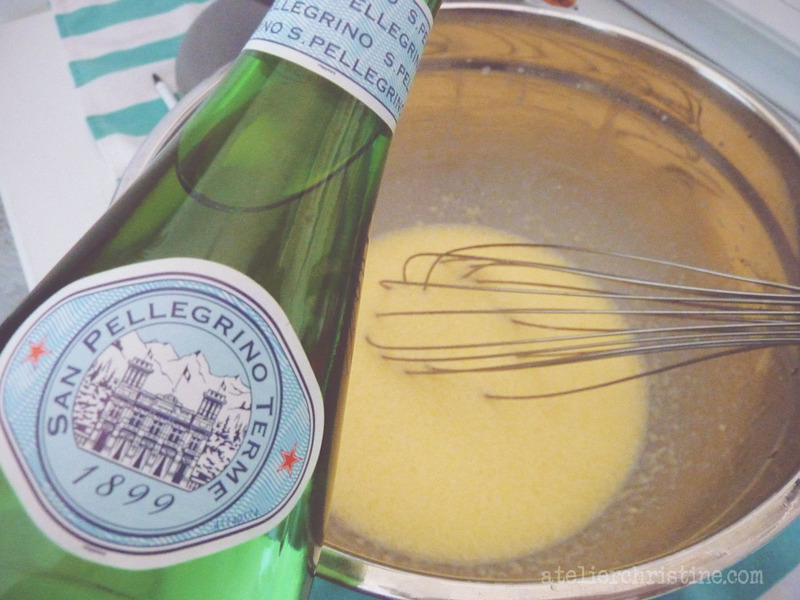 Gently combine butter, oil, eggs, baking powder, milk and sparkling mineral water. You can substitute sparkling mineral water with seltzer or soda/carbonated water. Assemble pastry. Grease bottom and sides of a 12” round pan – if your pan is less than 2”-deep I suggest placing it on a baking sheet to prevent oil drippings. 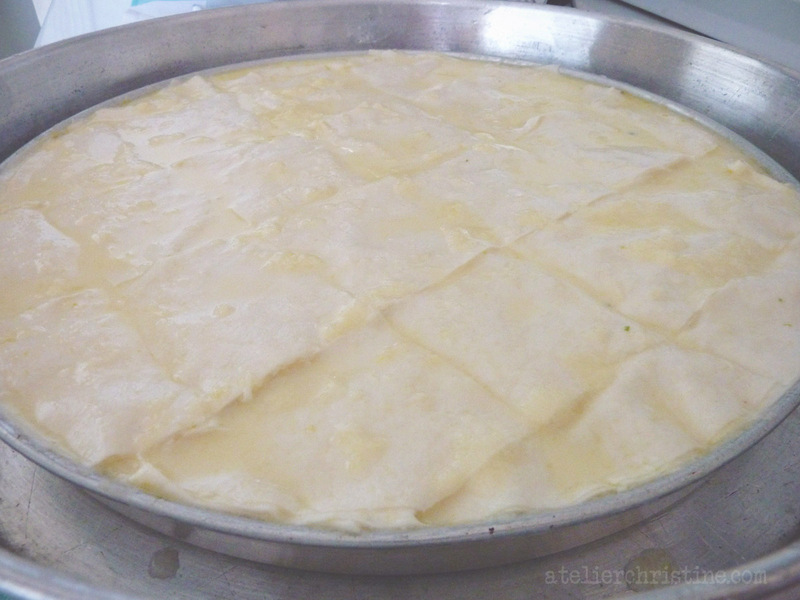 Cut three layers of phyllo dough the size of your pan and set aside until ready to use. Tear remaining sheets into medium-sized pieces. Place one of the three circles at the bottom of the pan and generously wet with some of the liquid mix. 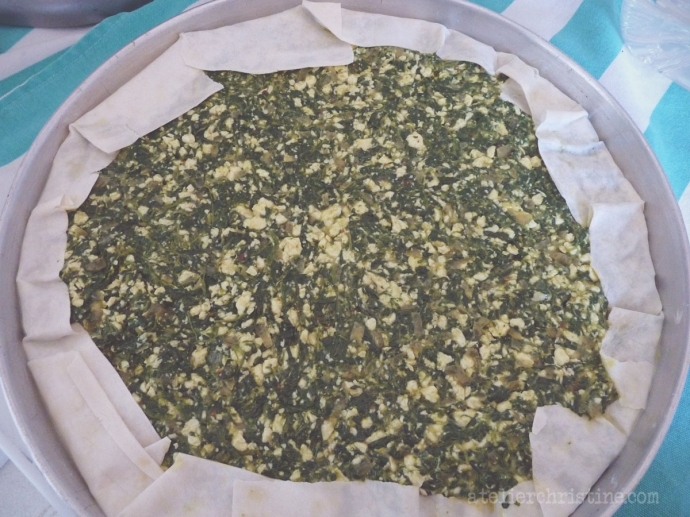 Continue layering half of the torn sheets, slightly overlapping and going up the sides of the pan and dousing in between the layers with more liquid as you go along. Once half the sheets are used, evenly spread the spinach-cheese mixture and gently press to pack. Fold in overhanging edges over filling. 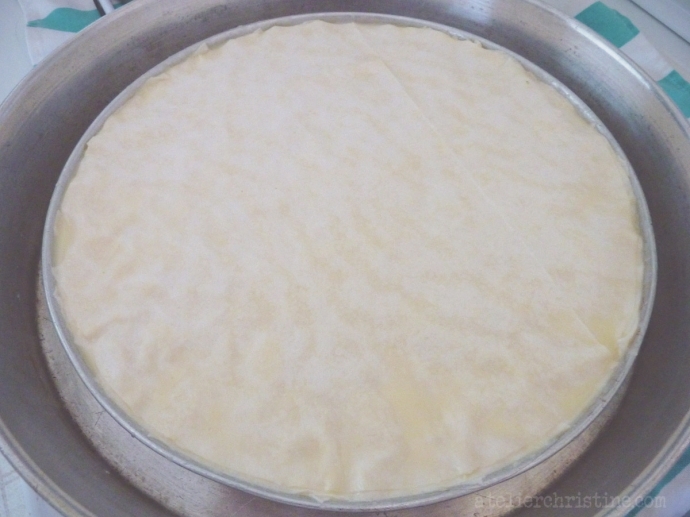 Continue layering remaining phyllo dough in the same manner. Finish off with the two pre-cut circles of dough. 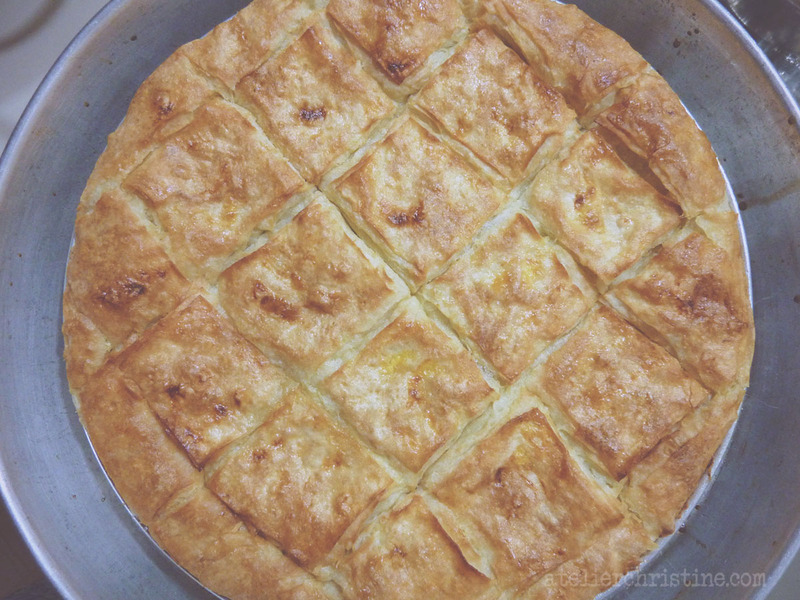 Cut pastry into squares all the way to the bottom and pour all remaining liquid mix where the cuts are made. Cover and refrigerate 2-to-3 hours. Bake pastry. Preheat a conventional oven to 385F-to-400F. Brush pastry with prepared egg wash, wait 5 minutes, then brush once more. Bake 25-to-30 minutes on the middle-lower rack. Move rack to the middle and bake for another 15-to-25 minutes until puffy and nicely golden brown all over. * if using a convection oven, adjust temperature and timing according to your manufacturer’s suggestions. You can either reduce the temperature by about 25F and bake it for the same amount of time, or keep the same temperature and bake if for less time, or reduce both temperature and bake time and just keep a watchful eye until done. Once you remove the pastry from the oven it will be puffy and steaming hot. Using a toothpick, poke holes where the cuts are made to allow steam to escape; it will gradually deflate. Rest 10-to-15 minutes, cut into square and serve – it is equally good served slightly warm or at room temperature.